In 1904, Henry Ford dreamed of selling his cars in the British Empire- this would require a production facility in Canada, close to his Detroit production facility. Walkerville was a natural location for the new facility, given its superb infrastructure of railroad, ferry boats, electricity and water, all designed by entrepreneur extraordinaire Hiram Walker. Henry Ford agreed to buy the Walkerville Wagon Works, after a series of meetings with owners Gordon MacGregor and Charles and John Stodgell. The documents to seal the deal of what is arguably one of the most important Canadian business transactions in the 20th century were signed at The Exchange (the Old Vic). The Old Vic owes its existence to Charles Chilver, a Walker supporter, building & road commissioner, and developer. (Chilver Road is named after him.) In May 1897, he converted his house at the corner of Chilver and Assumption into a tavern and after much deliberation, christened it The Walkerville Exchange. In August 1900, the business was sold to Frank Laforet, reputedly one of the first door-to-door milkmen in the region. The hotel served as an overnight facility catering to passengers in horse-drawn carriages headed to the nearby Walkerville train station. Business boomed and in 1906, a third floor was added which featured a balcony, awnings and stylish brackets. Lodging, meals and entertainment were available, while coal fired heating units at the end of the hallways kept the rooms warm in the winter. 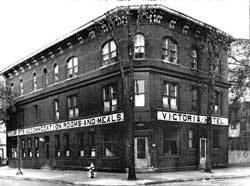 The name was changed to The Victoria Hotel sometime around 1930. The business stayed in the hands of the Laforet family until 1982; old regulars remember the spinster Ida Laforet, the colourful and eccentric descendant of Frank who lived upstairs. Ida reportedly never came down to the Tavern for 14 years! A major fire in 1968 resulted in a complete remodelling of the interior and some exterior brickwork. 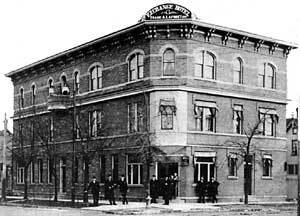 Then in 1982, an investment group led by Larry Burchell purchased the old Victoria Tavern. One partner was killed in a motorcycle accident while another died during surgery; Burchell stayed on as the sole proprietor. Burchell sold in 1987, but ended up back in charge in 1989. Today, Aaron Edwards has taken control of the reigns at the Old Vic after 5 years of bartending at the tavern. He has already overseen upgrades to the bar area, incorporating an oak cabinet that houses a selection of over 80 scotches. Guinness beer now flows from the taps, as does Walkerville Lager- the bar is one of the top sellers of it in the city. At one point, the Old Vic earned a reputation as a tough biker bar. Today, however, The Old Vic is, in fact, a traditional neighbourhood bar that caters to regulars (known affectionately as The Victoria Tavern Association of Professional Cocktailers) and a lunch crowd from all over the city. "The Old Vic is a comfortable and safe environment where you can enjoy quality draft and home-cooked meals", says Edwards. "Our U-shaped bar is very conducive to conversation and camaraderie, while our 'stand ups' are extremely popular during our special event parties." According to Edwards, "The Old Vic remains one of Walkerville's best kept secrets. Our clientele comes from all walks of life; you have a bus driver sitting next to a CEO of a large corporation." He continues to diversify the clientele, booking bands that cater to the university crowd on Saturday Nights. Coupled with the popular Blues Band "In the Pocket", playing to a packed house on Saturday afternoons, The Old Vic is now one of the most popular places in the city on any given Saturday. And says Edwards: "We pay careful attention to the temperature of our beer, right down to how we wash our glasses." "On Sunday, we barbeque our chicken and ribs over a fire made with oak wood from old Hiram Walker's barrels- the flavour and quality of our ribs are becoming legendary in the Walkerville and Windsor area." Edwards has ambitions to broaden his market further. Two sold out An Quaich Scotch tasting parties have been held recently, independent bands showcase alternative music (the Old Vic has developed a reputation as the venue for serious and independent musicians in the city, due to its incredible acoustics and intimate atmosphere), a Lingerie Show for Valentine's Day- along with the traditional sold out St. Patrick's and Victoria Day bashes. In the near future, plans are afoot to reinstall the brackets under the soffits to return more of the historical charm to the building. After nearly 100 years of providing lodging, food and drink, the Old Vic is a Walkerville tradition that seems destined to carry on well into the 21st century.